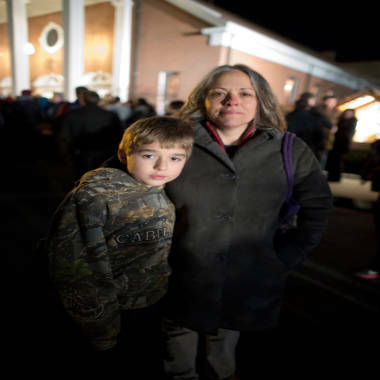 Residents of Newtown, Conn., embrace outside St. Rose of Lima Roman Catholic Church prior to a vigil for victims of Friday's massacre at the Sandy Hook Elementary School -- the second-deadliest school shooting in U.S. history. NEWTOWN, Conn. – Unexpected and unwelcome, gun violence tore through this hilly, wooded New England town on Friday, claiming more than two dozen lives – many of them just beginning – and shaking what one resident called a “small lovely village” to its core. “How can we be protected from people like this?” Jack DeFumeri wondered out loud, saying he moved to Newtown – founded in 1711 – years ago from much-larger Danbury because he wanted to raise his three daughters in a safe environment. 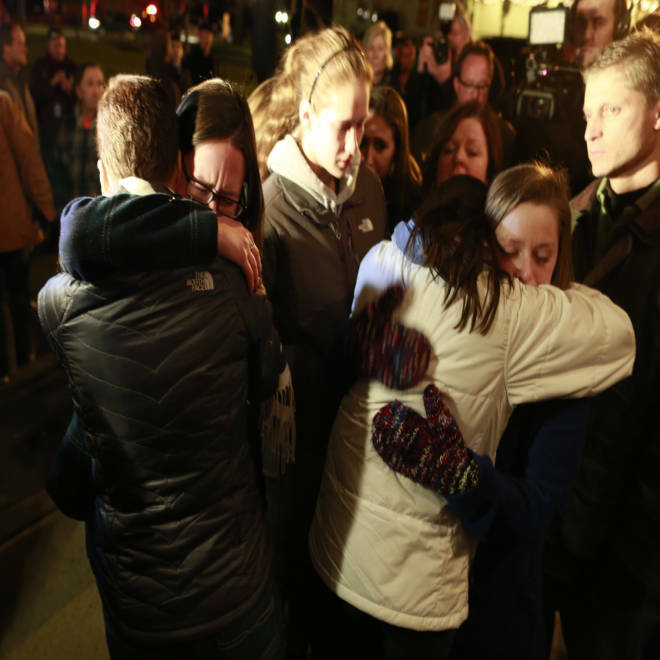 Friends and family from nearby towns flocked to Newtown to share the town’s grief and offer support after a gunman rampaged through the Sandy Hook Elementary School, killing 20 children and six adults. The gunman, identified as Adam Lanza, 20, was found dead at the scene, law enforcement officials said. The body of a woman believed to be Lanza's mother was found at their home in Newtown, authorities said. This small city of 28,000, with its tidy clapboard homes and steeple-topped churches, feels farther from New York City than the 90 minutes it takes to reach the metropolis. Residents from surrounding villages expressed similar disbelief that this most modern of crimes had intruded on their quiet corner of the world. After the vigil, Monsignor Robert Weiss told reporters gathered outside that six or seven kids who had attended the church were among the 20 children who died at Sandy Hook Elementary School. The shooting at Sandy Hook Elementary School that killed more than two dozen, 20 of them children, left the quiet community of Newtown, Conn., desperately trying to understand what happened. NBC's Kate Snow reports. Just a short drive away, parishioners at Trinity Episcopal Church shed tears and wrapped their arms around one another during a solemn prayer service. The quiet crying grew louder when the Rev. Kathleen Adams-Shepherd announced that two children, members of the congregation, were among those killed. Adams-Shepherd had spent much of the day at the fire station with the families of some of the presumed victims – though formal identification hadn't yet been made. "You've got to keep them in your prayers," she said, later adding, "I don't think we'll ever be the same." "There are no words,” the Rt. Rev. James Curry said in the prayer service. “There is nothing that we can say but instead we cry out. We cry out in shared grief and pain for the loss of so many children, so many adults .... We do not understand, and we cannot imagine why someone would murder. We cannot comprehend." Among those attending the service were the Elken family. "We just really felt the need to come in and say a prayer for all of the families," said Heather Elken, 47, an elementary school nurse, who attended with her husband, Karl, 48, and daughter Liia, 17. "We moved here 10 years ago,” she said. “We researched where to go for months and picked Newtown over anywhere else in Connecticut, and this is where we've raised our kids from seven years old through high school. We've lived here for the most important 10 years of our lives. We just don't understand." Heather and Karl Elken and their daughter Liia, 17, talk about life in Newtown, Conn., scene of Friday's mass shooting at Sandy Hook Elementary School, as they leave a prayer service at Trinity Episcopal Church. She said she and her husband learned about the shooting when Liia texted her from her high school at 9:46 a.m.: "Lockdown. Not a drill." "It was the longest day, just the longest day," Heather Elken said. Earlier, Peter Hugens, 78, had a hard time finding words to describe how the unspeakable tragedy that unfolded hours earlier at the nearby school would change the town that he has called home for 11 years, since moving from Brooklyn, N.Y.
“We moved up here – like many people – to get away from the so-called horrors of the city," he said, standing on his front lawn and looking out over the undulating Connecticut countryside. Outside a Dunkin Donuts store at a local shopping center, Kenneth Knapp said he was only beginning to process the horrific crime. The heartbreaking mass murder at Sandy Hook Elementary School was met with disbelief and tears as people across the country reacted to the tragic news. NBC's Kevin Tibbles reports. Knapp, an inspector in a machine shop, said Newtown wasn’t paradise, citing a criminal case still widely known locally as the “wood-chipper murder.” In that grisly case from the late 1980s, local resident Richard B. Crafts, a 50-year-old airline pilot, was convicted of murdering his 39-year-old Danish wife, Helle, then dismembering her body and disposing of it in the dead of night with a wood-chipper. “You'll see a lot of things this town has probably gone through, a lot of things, but nothing to this magnitude,” he said. His friend, Tom Adams, 66, who has lived in Newtown since he was 8, said that his 5-year-old granddaughter was in a classroom adjacent to the ones where Adam Lanza, a troubled 20-year-old, allegedly carried out the massacre, but she escaped unharmed and, so far, untroubled by the horrific crime. He said that he was on his way to see her. “I just want a hug, that's all I want,” he said. Theresa Swift and her son, William, outside St. Rose of Lima church in Newtown, Conn. But older, more aware youngsters, even some who were far from the shooting, weren’t immune to the trauma. Theresa Swift, 47, and her 10-year-old son, William, who attends another Newtown school, were already contemplating what would happen when the alarm sounded on Monday morning. His mom quickly reacted, reaching to touch William with a steadying hand. NBC's Alex Moe contributed to this report.